I always have lentils in my cupboard. It's the ideal ingredient. It requires no soaking, it is versatile and is very nourishing. 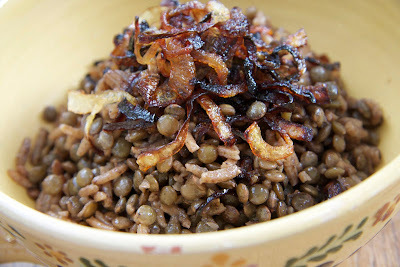 Yesterday I cooked moudardara which, in Arabic means, ‘scattered' or 'dispersed’, describing its texture: each grain well separated from the next. It is important not to over cook the lentils and to stop them from becoming mushy. Moudardara is more 'pilau' than 'risotto'. Absolutely no stirring! There is no need to reheat moudaradara, serve it at room temperature with salad or cucumber yogurt. If you soak the lentils they require half the cooking time. Cut one onion in half and slice it finely. Coat with salt and set aside for a few minutes. Pat-dry with kitchen paper before frying. 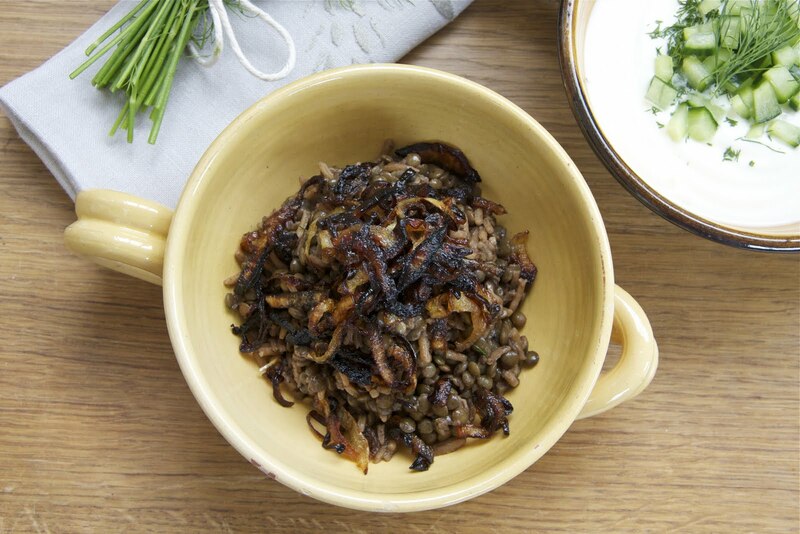 Heat 4 tablespoons of olive oil in a pan and fry the onion slices until they turn a dark brown colour. Lift out with a slotted spoon and place on kitchen paper to absorb the excess oil. Reserve and use as garnish. Chop the remaining onion finely. Place in a deep pan with oil and cook on medium heat until it turns a deep golden colour. Add lentils, spices and water. Bring to the boil. Reduce the heat to low and leave to simmer for about 20 minutes. Add the rice and season with salt. Stir once and leave to cook on low heat for a further 20 minutes. The lentils should be soft while keeping their shape. Add a drizzle of olive oil and allow to rest for 5 to 10 minutes. Mix the rice lightly with a fork before transferring on to a dish. Garnish with the reserved onions. Serve at room temperature with cucumber yogurt. 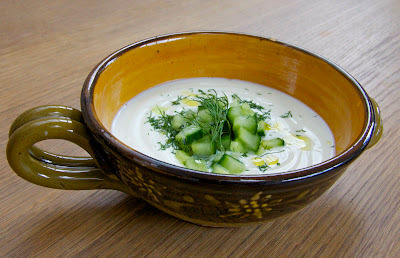 Place the yogurt in a bowl, season with salt and add the dill. If using garlic, mix it in thoroughly. Combine the cucumbers with the yoghurt. Transfer to a serving bowl and garnish with chopped cucumber, dill and a drizzle of olive oil. Simple recipe with a humongous taste and an excellent prescription to a healthy body. Just make sure and add garlic. t. The objective here is little conduct design change drive the psyche to be aware of its activity and genuine choice can be made to eat it or the amount to eat and understand the essence of the sustenances.